With 2018 now behind us and a new calendar year just beginning, now is the time to make resolutions and take steps to improve our lives. Whether our goal is to lose weight, get more sleep or change unhealthy lifestyle habits, there’s never been a better time for setting changes in motion and welcoming greater positivity and well-being into our lives. Many of the resolutions we make for ourselves can also benefit our horses so it’s worth sparing a thought for how 2019 could have a constructive impact on their fitness, health and happiness going forward. To get the ball rolling and help you come up with your own ideas, here are VioVet’s top 5 resolutions for the New Year! Review your horse’s diet and the supplements you are feeding. Decide whether your horse is the correct weight by fat scoring, and decide whether your supplements are actually working. Consider enlisting the help of an equine nutritionist alongside your vet if in any doubt about your horse’s weight or condition. Review how much turnout and high quality forage your horse is getting – does this need increasing or restricting? If you compete, make yourself aware of banned substances including Devil’s Claw which was added to the ‘prohibited substances database’ in January 2016. Design a clear worming program so you’re fully aware of what to worm and when. Write this down and put it somewhere visible so your friends and yard mates can benefit from it too. Our ultimate ‘Guide to Worming’ includes a helpful table listing seasons, parasites to treat, and relevant wormers, which can be printed and pinned up in the tack room. Join a Pony Club or riding organisation to socialise and meet like-minded people. This can be a fun experience for both you and your horse! Whether you want to compete or would simply enjoy a group hack, there are places you can go and people you can speak to to progress, face new challenges, and embark on new friendships. 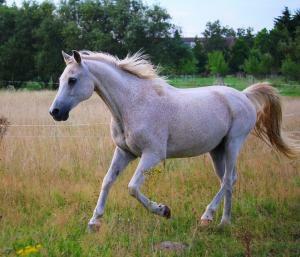 Your horse will also benefit from increased exercise time, fresh air and the opportunity to get amongst other horses. Give your tack a once over and make a note of any repairs that need to be made, and items that you need to replace. Give everything a thorough clean before doing this to make the job that bit easier. If you compete affiliated, make sure your riding hat meets new regulations and is kitemarked to the PAS015 standard. You can find out more about the riding hat changes here and view our range of helmets conforming to this standard. Make time for your horse every day and enjoy your time together. Don't just pay your horse a visit when you want to work or ride him, but make time for simple things like grooming, hand feeding and belly scratches, as these are great opportunities to bond. To make sure your horse is in good all-round health and fitness, schedule yearly check-ups with your vet so that you identify problems early. If you have any suggestions of your own, please comment below and share your ideas with our other readers! As winter is only half way through, I have found that my grooming kit (ALL BRUSHES AND COMBS) really needs a good wash. Take them home and wash thoroughly in hot soapy water, use a hoof pick to clear hairs out, rinse and dry overnight. I do this once a month. Clean horse, clean rugs..